Sailing yacht Elan 384 Impression called Gwinn has been produced in 2005. 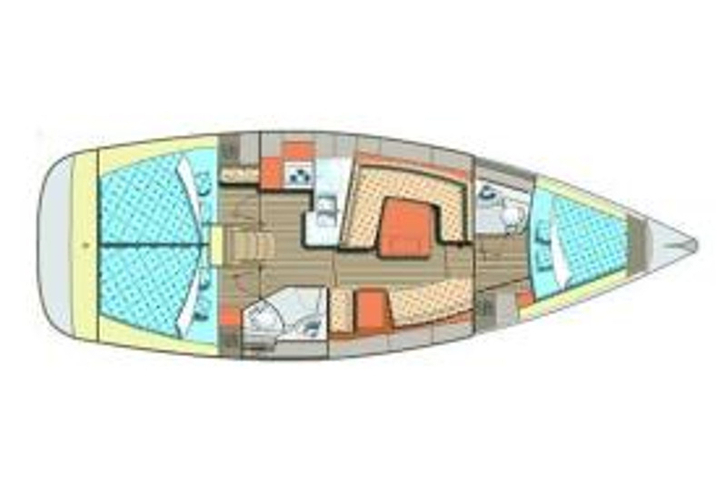 We propose this vessel from harbor Pula in region Istria. Gwinn is licensed for 8 passengers. Layout of the sailing boat is 8. Elan 384 Impression Gwinn has 3 bedrooms. For guests disposal there are 2 bathrooms. You can fill the diesel tank with 165.00 l liters and in water container it goes even 260.00 l l. With engine 40 Gwinn can move really fast. Gwinn is 11.55 m long and 3.91 m wide. 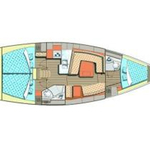 Draft is 1.80 m. You can search other vessels by going to this section: Yacht charter Pula. 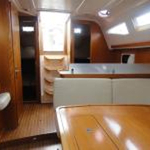 Sailboat's equipment includes : Bimini top, Anchor electric windlass, Teak cockpit, Dinghy, Radio / cd player, Bed linen, Heating, Autopilot, Gps plotter, Furling mainsail. . Security deposit there is 1300.00 EUR. Choose our offer and enjoy your vacation on the deck of Gwinn. This Elan 384 Impression from Pula from Croatia You can search following this link: Yacht charter Croatia.